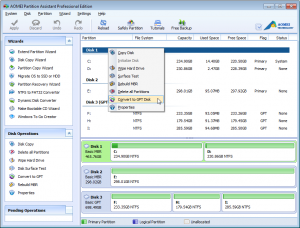 AOMEI Tech, an innovative hard disk partition management solution provider, announces the release of new Partition Assistant 5.5 on Dec, 03, 2013 . The new version improves the performances and adds new features that are based on the original. With the update, AOMEI Partition Assistant is obviously global unique and almost perfect just within years since it was firstly released in 2009. Compared with all other disk partition software, AOMEI Partition Assistant 5.5 is out of ordinary and magic. You may take a quick look at the overview of the PA5.5 new features. 1. Convert system disk between MBR and GPT styles. GPT was introduced as part of the UEFI initiative. You may notice that the program prevents you from converting system disk, since GPT system disk only boot from UEFI motherboard, but MBR system disk could not boot from this configuration. The previous versions allow you to do such operations only on data disk, but not system disk. 2. 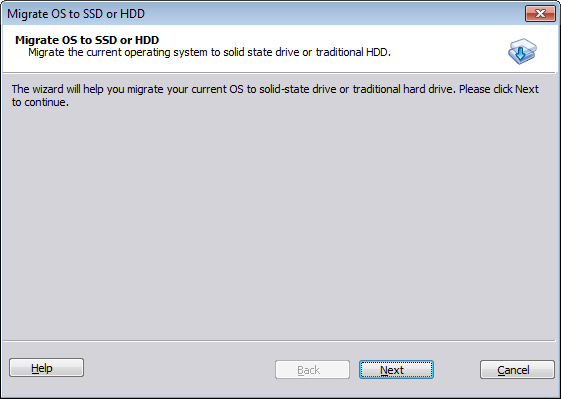 Migrate system to SSD and support MBR and GPT disk. This new feature allows you to migrate OS on MBR or GPT disk to new SSD, and GPT and MBR disks, while the previous versions only allow you to migrate OS on MBR disk to SSD or MBR disk. 3. Windows To Go Creator, installing Windows 8 to removable flash drive. 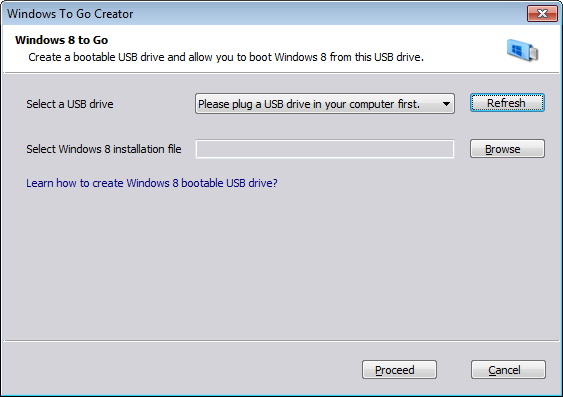 Windows To Go Creator is a completely new built-in utility which can help you install Windows 8 to removable flash drive. It is really convenient and you can boot Windows 8 up from the drive after the installation. 4. Completely support hard disk with 4096 bytes sector size. It’s well known that disk track is made up of a series of sectors, and there are gap, lead-in and false checksum info between them. 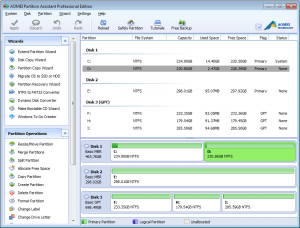 The problem on efficiency of 512 bytes hard disk is gradually raised, but it is now could be avoided as the brand new Partition Assistant 5.5 is completely support hard disk with 4096 bytes sector size. 5. 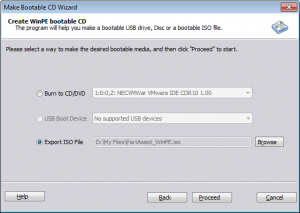 Create Windows PE bootable media without having to install AIK/WAIK. Windows Automated Installation Kit (AIK or WAIK) is a collection of tools and technologies produced by Microsoft designed to help deploy Microsoft Windows operating system images to target computers or to a Virtual Hard disk. 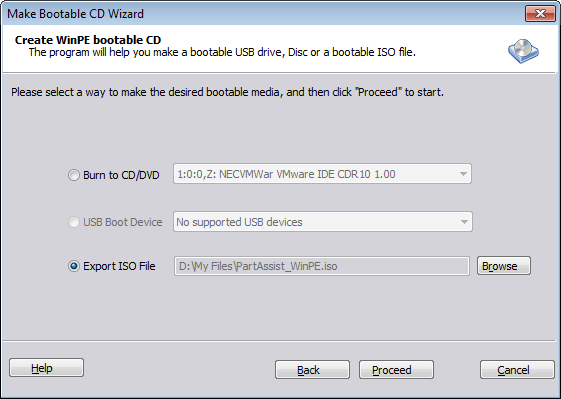 The PA5.5 can help you create PE bootable media even without installing AIK/WAIK. 6. Fully compatible with Windows 8.1. 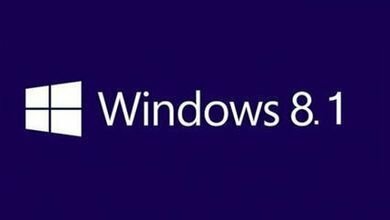 AOMEI Partition Assistant 5.5 works well with the latest Windows system—Windows 8.1 and as far as I’ve concerned, the software is perfectly compatible with all Windows platforms. 7. Quality improvements and some bug fixes. In this upgrade, the brand new Partition Assistant keeps the features of the previous version and some bugs have been fixed so that you can have a better experience. 1. 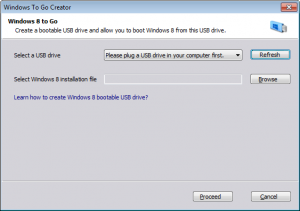 Windows To Go Creator, install Windows 8 to removable flash drive. 2. Completely support hard disk with 4096 bytes sector size. 4. Fully compatible with Windows 8.1. 5. Quality improvements and some bug fixes. 1. Completely support hard disk with 4096 bytes sector size. 2. Fully compatible with Windows 8.1. 3. Quality improvements and some bug fixes. To use these new feature, please go to download or upgrade center to replace the old AOMEI Partition Assistant with new one. How to Partition/Resize Hard Drive Already Containing Windows 7?